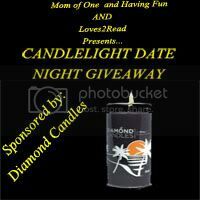 Mom Of One and Having Fun, Loves 2 Read, Crazy About Deals, Oh My Heartsie, My Charmed Mom, Missi Rose's Coupon Spot, Coupondipity, Dnbuster's Place, 7 Kids and Us, Krazy Kabbage and other fabulous bloggers are bringing to you Candlelight Date Night, sponsored by Diamond Candles! Diamond Candles are Earth Friendly, all natural soy candles. While they are not organic due to resources not yet available, they are 100% soy. They do not contain bees wax, palm wax or parrafin wax. They will be looking into their candles becoming organic when resources come about. It's always great knowing that a company is looking for a more natural make. Not only this, but these are NOT your typical candles. YES- $5,000! Wouldn't you LOVE to be that person?! 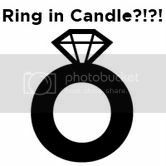 Men here's a great idea if you cannot afford the Ring... Buy the candle and HOPE you get lucky! Even if the ring is worth $300-$500, that's still only $24.95 you spent. Click here to run and buy one NOW! How do you know it's worth? If the ring has 14K inside of it or any other branding your ring is worth $100+ and run to the jeweler's for the estimate. The ring sizes are typically 6-8. If you find that this is too big or too small, you can give it away or re-size it (if it's one of the $100+ rings). Something else unique? They actually allow you to suggest scents. We bloggers are sure you would love to make YOUR favorite scent a candle. They have Cotton Candy (yum), Snow? Really... Snow? Anyone know what Snow smells like?! We're curious! Going to have to try that one in the future. Sweet Pea, Chocolate Truffle and many, many more. Ready to win? Diamond Candles is Giving Away 3 Candles worth $25 each! We hope you will be happy to enjoy these great scents, and have a nice romantic dinner by them. We know many parents could use a night to themselves. 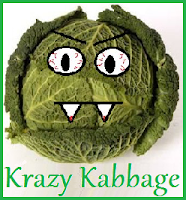 Just don't expect us to cook the dinner or babysit! 3 Winners will be receiving one candle of your choice. You get to pick the scent!